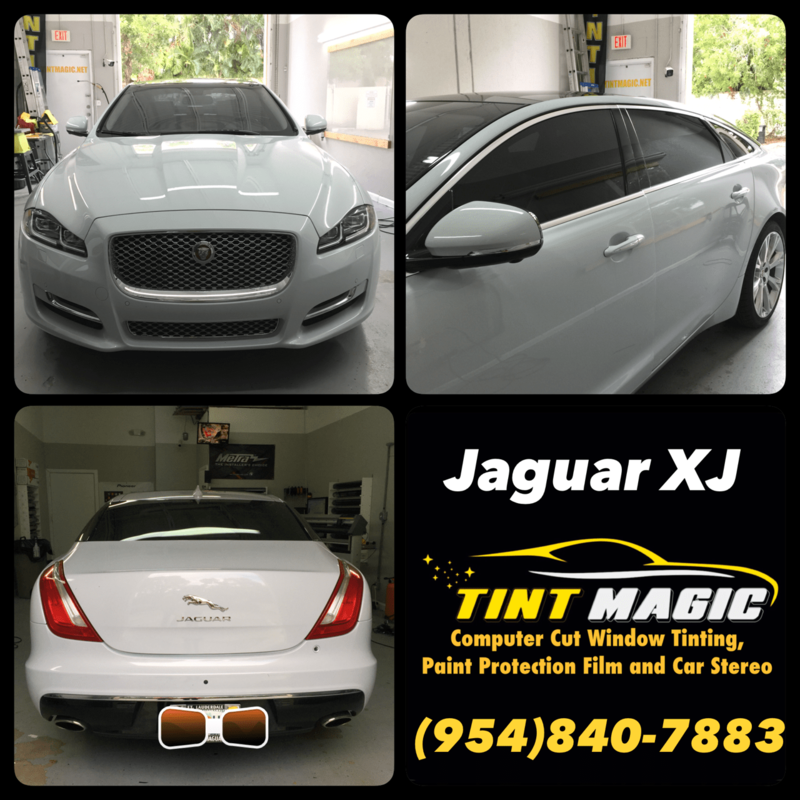 Jaguar XJ window tinting at Tint Magic Window tint Coral Springs. call us for a free estimate! (954)840-7883. We are located at 11344 Wiles Road Coral Springs, Fl 33076. In many ways, the 2018 Jaguar XJ embodies the ideal traditional luxury sedan. It features commanding engines and agile handling, and its styling is stately and sophisticated. However, numerous interior hiccups lower its standing among peers. The Jaguar XJ receives mixed reviews. This commanding large car is praised for its fleet of supercharged engines that move it with authority. The XJ is surprisingly nimble for a vehicle of this size, eliminating the sensation that you’re navigating an unwieldy barge. On its own, the interior is admirable for the most part, boasting cushy seats and options like fold-down tables and footrests. However, alongside more elegant competitors, the XJ can come across as undersized, dated, and lower-quality. If stately British grandeur charms you, the Jaguar XJ may be a good match. It’s dignified inside and out, with impressive V8 engine options and agile handling among its standout qualities. This XJ is also a decent value when you consider that it’s thousands of dollars less than many competitors yet has a full suite of active safety features and an appealing array of tech features on every model. The Jaguar XJ is one of the least expensive models in our super luxury car rankings. Prices for standard-wheelbase models start at $75,400 (for the XJ R-Sport) and reach as high as $93,000 (for the XJ Supercharged). The three versions of the long-wheelbase configuration include Portfolio ($84,500), XJL Supercharged ($96,300), and the all-new XJR575 ($122,400). This four-person sedan features handsome styling, more rear-seat legroom than either of the XJ’s wheelbase versions, and a high-tech infotainment system that can be controlled using hand gestures. Its powerful engine options include two V8s and a V12, the latter of which is rated at 601 horsepower.